An abstract submitted by The Student Chapter of the American Society of Consultant Pharmacists (ASCP) was selected as one of the top four at the ASCP National Conference held at National Harbor, Maryland in early November. Student leaders Kara Ioannou, Diana Mansour, Tristan Thompson, Kristel Chatellier, Amanda Schwenk and their advisor Christine Ruby Scelsi, PharmD, BCPS, BCGP, FASCP, submitted the abstract about the development of their organization. 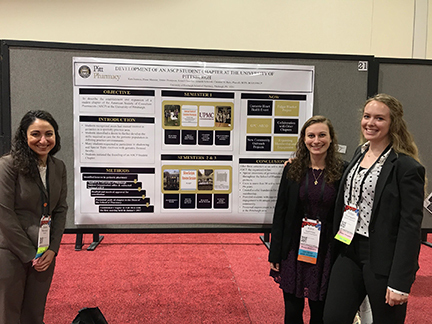 PittPharmacy PharmD students, (photo above) Diana Mansour (Class of 2020), Kara Ioannou (Class of 2019), and Tristan Thompson (Class of 2021) were awarded an official ribbon at the presentation for their poster which detailed the process of starting a new student organization, growth of the chapter over the last three semesters and advancement of current outreach activities. The students were recognized for spreading geriatric awareness throughout the pharmacy school and creating a foundation for continued growth of the organization. The Student Chapter of the American Society of Consultant Pharmacists (ASCP) at the University of Pittsburgh was established in the spring of 2017.